The vast majority of so-called A-listers are bright but otherwise normal people who were in the right place, writing about the right things, at the right time. Many are my clients, paying me as much as $5,000 per month to advise them. Because they stumbled into popularity. Because they realize they got lucky, and they are desperate to seize the opportunity before it slips away from them. When you do something amazing once, you might know what you’re doing. When you do it twice, you probably know what you’re doing. When you do it three times, you definitely know what you’re doing. Well, I’ve built wildly successful blogs three separate times. First, I worked under Brian Clark as we built Copyblogger into a multimillion dollar brand. Next, I worked with Neil Patel and Hiten Shah to launch the KISSmetrics blog, bringing in hundreds of thousands of visitors in just the first few months. After that, I started my own blog, formerly Boost Blog Traffic and now Smart Blogger, and I took it to 40,000 subscribers within two years. Now, Smart Blogger subscribers are more than four times that number. Could I just be lucky? Stop messing around with blogs in your spare time. Instead, look at this like a career and get serious about mastering your craft. First, you have a job and a family, so you can’t just drop everything and become a blogging addict. Second, you probably can’t afford to pay me $1,000 an hour. Hobbyists: people who like the idea of having a place to express their thoughts but have no expectations. They just like writing, and they don’t care if anything comes of it. If they make some money, great, but if nothing ever happens, that's fine too. Serious Bloggers: people who see their blog as a means to an end. Sure, they love writing, but their real purpose is to create a side income, build a platform for their book, attract clients, or promote their business. In other words, they’re not blogging just for fun. They expect results. The problem is, most of the blogging advice out there is for Hobbyists. It’s watered-down, extremely simple content that gives you a few tips and tricks but fails to teach you how to get real results from your blog. For the first time, I’m publishing everything I know about building a successful blog. Normally, I only talk about traffic, and we’ll cover that here too, but I’ll also dive deep into building your email list, technical setup, and the topic everyone wants to know about: how to make your readers fall in love with you and keep coming back. Not just a few vague steps either, but nuts and bolts instruction showing you every single step and detail. A 30+ page special report. This isn’t some beginner-level document teaching you a bunch of stuff you already know. We dive deep into advanced tactics and strategies, giving you real-life examples from myself and my clients, breaking it down so you understand exactly what to do. Short, to-the-point videos giving you first-hand demonstrations of how to use the blogging tools we use and recommend and put the strategies from the report into action. In other words, no more wondering what to do. Instead of stumbling around by yourself, you'll be able to learn from Marsha, our senior instructor, during her live monthly workshops, or the dozens of video tutorials in the Tool Library. Every day, we make new discoveries about the best ways to do things, and those discoveries will turn into in-depth reports in the future as well. If you're a new blogger or haven't launched your idea yet, we'll give you the sequence of courses to get you going. And if you've been around longer but have lost traction, we'll show you how to get rockin' again. Posts We Publish for Free? At 30+ pages, we’ll go into much greater depth than we can in a typical 2,000 word blog post. We’ll talk a lot more about how to do everything, instead of just telling you what to do. You’ll also receive checklists and any other supplementary materials we think are helpful. That’s why we created Serious Bloggers Only: to help you get to the next level. And yes, that involves giving you more advanced training, but it also means upping your game. We’re not going to water down the content or hover around and make sure you do the homework. It’s time to put on your big boy (or girl) pants, and get to work. In some ways, this whole program is a type of graduation. When you first started, you were probably happy with all the free content on the web. It was all you could handle. Now though, you might be feeling like a lot of the posts out there are a little… fluffy. They give you a lot of ideas, but they don’t give you step-by-step details on exactly how to do it and get results. If that’s the case, it’s time for you to “graduate” to Serious Bloggers Only. You’re ready. HOW IS THIS DIFFERENT FROM OUR THE GUESTBLOGGING CERTIFICATION COURSE? Guestblogging.com is a masterclass in a single, powerful traffic strategy. It covers everything you could possibly want to know about guest blogging… but nothing else. Serious Bloggers Only, on the other hand, covers a little bit of everything you need to know. It gives you a couple dozen "mincourses," teaching you just enough to take action and get results without overwhelming you. It’s kind of like a big, fat recipe book versus attending a French chef school. Serious Bloggers Only is the recipe book. You’ll get lots of tried-and-true “recipes” for making your blog a raving success, covering every “cuisine” imaginable. GuestBlogging.com is the French chef school. You’ll become a master of a single “cuisine,” and if you work hard, you might even become world-renowned for your skills. If you’re serious, you want all the education you can get. Recipe books are helpful, but at a certain point, you also want to achieve mastery, and to do that, you’ll need a masterclass dedicated to that topic. You can’t choose one or the other. They both have their place. Other Membership Programs for Bloggers? Everything I give you in Serious Bloggers Only is compact. No webinars to attend just to be tempted with a few basic morsels, no interviews listening to people stutter and go on tangents, no sitting in front of your computer for hours and hours on end watching videos. I hate that as much as you do. So, instead, I give you a report you can read in 30 minutes, teaching you all the important things you need to know and nothing else. You also get checklists to help remind you what to do, making it easier for you to take action without reading the report again and again. You get resources that tell you what tools to use, with links and recommendations, and tutorials that show you how, step-by-step. You get a private, hidden Facebook group where you can talk to other bloggers. And you get a private forum, if you don't like stepping foot inside Facebook. You also get the support and dedication of one of my top team members and proteges, Marsha Stopa, who has coordinated the creation of the courses since Day One, has learned at my side for more than five years and knows this stuff as well as I do. We have different strengths. None of our competitors can say they make $50,000 per webinar, nor are they as good at autoresponders as us. But they’re better at other things. Like podcasts, for example. We still haven’t done one of those. We don’t do a lot of affiliate marketing either, so if that’s what you want to learn, you’re better off looking elsewhere. I only release training on things we actually do. Anything else would be kinda dishonest. The hardest part about building a platform on the internet is finding the right consultants to help propel your business forward. I was completely stopped in a few areas not knowing which steps to take next. Just one of his golden nuggets of wisdom had me stop doing something that was taking up an enormous amount of time and start focusing on another area of my business that added $40,000 to my bottom line in just 5 months. I landed over 1,000 new subscribers the first month after working with Jon. He literally changed my life: I finally felt confident enough to quit my job and blog full-time. Seriously, Jon is a blogging God. I know it’s over-the-top, but there’s no other way to describe him. "Jon is the best teacher you could find on this subject without a doubt. You can find plenty of blogs that teach about blogging, but I guarantee you there isn't another program online that provides the deep, detailed information on how to get ahead in blogging. The best stuff always costs money. This is the best stuff, and worth every freaking penny he charges. It's astoundingly excellent material." I could list hundreds more, but you get the point, right? In fact, you might be wondering how much advice from someone like me is going to cost. Let’s talk about that next. Well, that’s essentially the deal I’m offering you here. 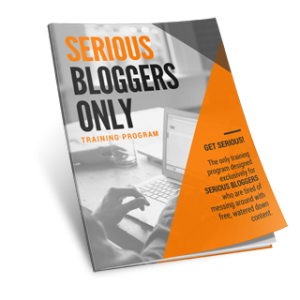 Your membership fee to access Serious Bloggers Only and learn everything I know about blogging is just a measly $49 per month – about the same price as a cheap dinner for two. In the past, I’ve charged ultra premium prices for each of my programs. The least expensive course we offered was $591 – a steep price if you’re a newbie blogger. We have intensive programs that cost $2,500. We also had coaching programs going up to $10,000 per year. And let’s be clear: they sell out. Often, the class is full within a few hours of opening registration. So, there’s no mathematical reason to lower our prices. Right now, there isn’t a place on the web for people like us. Sure, the web is overflowing with blogging advice, but nearly all of it is targeted at hobbyists who could care less about mastering their craft. But you and me? We’re different. To us, blogging isn’t a hobby. It’s a launchpad for publishing a book, getting clients, selling a product, maybe even becoming a public speaker. And we’re very, very serious about making it work. Up until now, you might’ve thought you were alone. The truth is though, there are thousands of people like us. We just haven’t had a place to gather. Serious Bloggers Only is the home for people who are serious about blogging. Over 1,000 members – each and every one of them dedicated to mastering their craft. Just a quick note to let you know that I just registered for Serious Bloggers Only, and I am so psyched. As I read through the sales page, I just kept thinking: this is like an answered prayer. I've been hoping for a program that offers exactly what you describe (step-by-step how-tos for self-starters who are serious about blogging), without simultaneously requiring a large upfront investment. And the fact that you're offering it means that I can trust that it will be the best of the best. I've already gleaned a great deal from your posts -- I'm closing in on my first 1,000 subscribers, gaining interest from publishers, and earning more and more from speaking engagements -- and now feels like the right time to take it to the next level. I feel exactly like Charlie and the Chocolate Factory when he received his ticket!!!!!!!!!!!!! Thank you SO much for putting together Serious Bloggers Only. It is exactly what I need at exactly the right time. I am so excited that it's real, and it's affordable. I feel like if I'm unclear and scattered on a blog focus right now and that it's not yet a real business, I shouldn't be spending big bucks on something that doesn't exist. Will you love Serious Bloggers Only just as much? I’d like to think so, but there’s no way for me to know for sure. So, that’s why I’m making it easy for you to try it out. Sign up today, check out the training materials for 30 days, and decide what you think. If you’re not overjoyed with the content, let us know, and we’ll issue you a refund. No questions asked, no delays and you can keep the content. The money goes right back into your account. You can also cancel your account at any time. You don’t even have to talk to us. You can cancel it within the member’s area with a click of a button, and you’ll never be billed again. Ever. There’s absolutely no risk for giving this a try. If you want in, just click the button below. I'm Serious! Let Me in! Serious Bloggers Only can save you from some of that. Not all of it – learning anything is struggle – but what if we save you just a few days of frustration every month? Is that worth $49? If you’re not willing to commit $49 per month to mastering your craft, you’re not very serious, now are you? This program, on the other hand, is $49 per month. Granted, we don’t have fancy classrooms or those hats with the little tassels, but stick with it, and do the exercises I give you, and you’ll learn just as much. Copyright © 2018 Smart Blogger. All rights reserved.